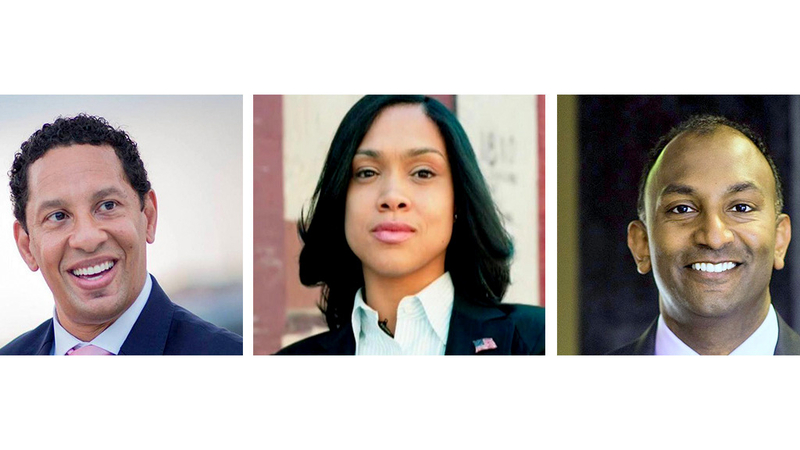 Above: Candidates for state’s attorney from left: Ivan Bates, Marilyn Mosby and Thiru Vignarajah. With a week to go before Baltimore’s next state’s attorney is decided by voters, the two challengers to incumbent Marilyn J. Mosby continue to trod down widely divergent money paths. Spending is key to challengers Ivan J. Bates and Thiru Vignarajah, who had little name recognition among voters before tossing their hats into the ring. Bates, a defense lawyer, touts his courtroom experience, while Vignarajah, a former deputy Maryland attorney general, extols his independence and calls for police accountability. Both have described Mosby as ineffective in the wake of Baltimore’s post-Freddie Gray homicide spike. They further fault her for failing to fix a failed juvenile justice system. And when they’re not attacking the incumbent, Vignarajah and Bates snipe at each other for hyping their own crime-fighting records. Bates spent nearly $290,000 over the last month, chiefly on TV ads that blanketed cable and broadcast airwaves with his “experience” theme, according to his latest campaign filing with the Maryland Board of Elections, which covers the period May 16 – June 10. So far eschewing television, Vignarajah has taken to social media and to the radio to make his “Justice for All” case, forking out $36,231 in media expenditures in the last four weeks. The bottom line is that Bates will enter the final push to the June 26 Democratic primary with $127,000 left in his war chest, while Vignarajah boasts a cash balance of $420,000 – an amount that appears nearly impossible to spend effectively in the remaining days of the campaign. With one paid worker and no TV ads so far, Vignarajah is holding on to most of his campaign cash. In the meantime, Mosby has followed her own political muse. She deployed her first TV commercial, titled “Fighter,” on the eve of early primary voting last Wednesday. Narrated by Baltimore Congressman Elijah Cummings, Mosby portrays herself as a reformer and warrior for justice for all Baltimore residents. It’s the same theme that she has been hammering away at in radio ads, focusing on the same audience as Vignarajah at Radio One. Her campaign report shows $22,440 in ad spending at the mostly black listener radio station between mid-May and mid-June, compared to $11,050 expended by Vignarajah. Mosby and Bates have both bulked up on paid staff since mid-May – Mosby spending $10,700 and Bates $10,475 on a total of 10 campaign workers. Bates paid $7,180 to his fundraiser, Martin-Lauer Associates since mid-May, while Mosby handed $7,000 over to her fundraiser, The Mellinger Group. Vignarajah reports employing a single paid staffer, who received $1,000 from a “special compliance account” on May 16. He spent $0.00 on an outside fundraiser, but expensed $407.25 on pizza and $20.98 on Dunkin’ Donuts for his volunteers. Bates raised $66,115 since mid-May. Major contributors include $5,000 from Benjamin Griswold of Brown Advisory; $6,000 from Michael Mullin of The Fite Group “dedicated to providing premier real estate services” in Palm Beach County, Florida; $6,000 from Willis Ryckman, co-founder of private equity firm Three Kings Capital; $4,000 from a subsidiary of Bozzuto Homes; and $5,000 from Brian M. Rogers, retired chairman of T. Rowe Price. Mosby raised $57,601 since mid-May. Major contributors include $3,000 from Murphy, Falcon & Murphy headed by lawyer William H. “Billy” Murphy; $2,000 from the Baltimore Teachers Union; $2,000 from the Metropolitan Baltimore Council of the AFL-CIO; $3,500 from Bradley Enterprises, a vending machine company; $2,000 from Enid Cruise of Absolute Chiropractic Care. Vignarajah raised $1,625 since mid-May. The three largest contributions were $300 from Athena Adamson of Easton, Conn.; $250 from Michelle Anderson of San Francisco; $250 from Deborah DeBella of Baltimore. Bates – $680,018 raised, $553,520 spent. Mosby– $515,216 raised, $248,708 spent. Vignarajah – $523,192 raised,* $96,064 spent. * Includes a $250,000 no-interest loan Vignarajah said he made to his campaign in January.